I don’t know what to name this beautiful kabab . 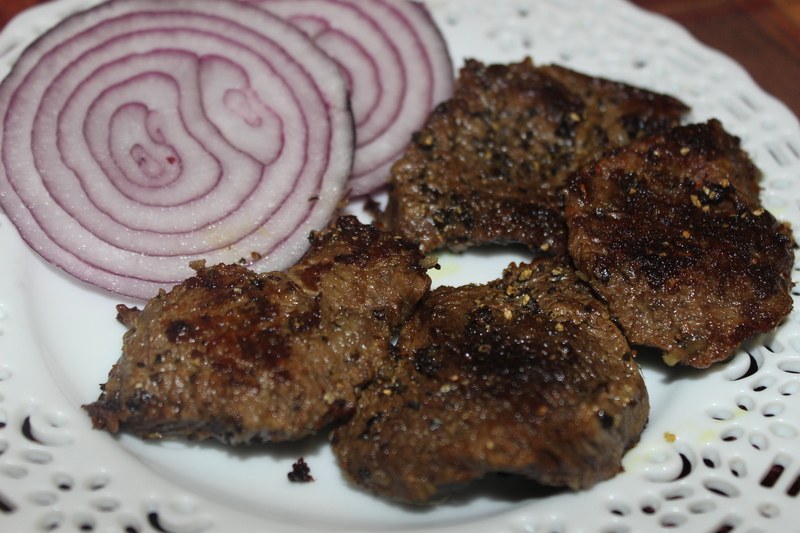 So decided , why not pan fried boti kabab ?? Since they are sliced into pieces and boti means pieces too .. This recipe I got from one of my dearest Aunts, Rina Salim khalamoni – my soul sister Putul’s mommy . I simply followed the procedure as Khalamoni said , just added one ingredient – vinegar . The beauty of this recipe is , you can make them ahead of time , can preserve in fridger . Just fry them whenever you feel like . 1. Slice the meat chunk in little thick pieces . It will be around 10 pieces . Now boil the meat with 3 cups of water , 1 and half tbl spoon ginger paste ,salt and vinegar until the water dries out or the meat is tender . Don’t boil it too much as the meat is too tender . We need tender but firm . If you still have some water in the meat , don’t worry , you can use it as beef stock in many other recipes . 2. Heat 1 tbl spoon ghee and fry them until little charred . Sprinkle the crushed black pepper and serve hot ! 1. Wash the meat . Now brine it with milk, sugar and salt for at least 2 hours . 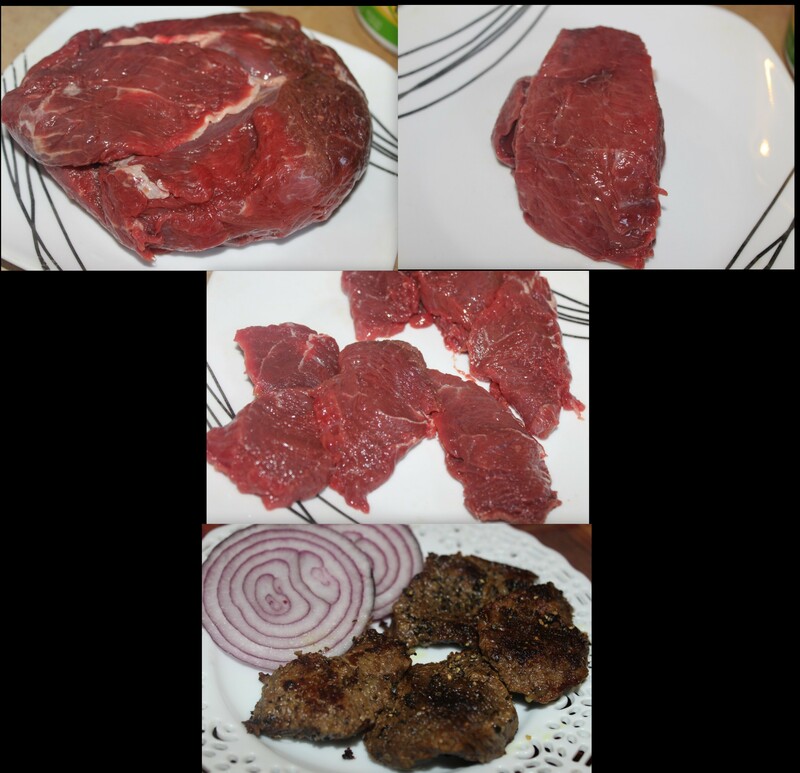 It will help to get rid of the smell of lamb as maximum as possible and will also help to keep the meat juicy . Drain out the milk and pat dry the steaks with kitchen towel. Dry completely. 2. Now marinate it with all the ingredients except oil for at least another 2 hours. 3. Heat oil in a grill or fry pan . Don’t put too muck oil . Only a small quantity of oil needed. Fry on medium heat . Turn over and fry . Keep doing so until the steak is done. It took almost 15 minutes for me . Enjoy with salad or your favorite dips. রান মুসাল্লাম বা খাসীর আস্ত রানের রোস্টের প্রিপেরেশনের ছবি দিয়েছিলাম. এই হলো ফাইনাল লুক. আলহামদুলিল্লাহ খুব ভাল হয়েছে. তাড়াহুড়োতে কেটে দেখাতে পারলাম না. এত tender, মুখে দিলেই গলে যাচ্ছে. দুটো স্টেপে রান্নাটা করি. একটু ঝামেলা হলেও সেটা পোষাই যায়. 😁 বছরে দুএকবার এই রান্না টা করি. একটু ঝামেলা হলে ক্ষতি নেই. আগেই বলেছিলাম,এই রান্না টা দুটো স্টেপে করা হয়. প্রথম স্টেপে চুলায় আর দ্বিতীয় স্টেপে অভেনে. যাদের অভেন নাই ;তারা অল্প আচে হাড়ির মুখ ভাল করে আটকে দামপাখত স্টাইলে রান্না করবেন. আমি শেষে বলে দিচ্ছি. রান মুসাল্লাম করলে চেষ্টা করবেন ,বাচ্চা খাসীর রান নিতে ,সোয়া থেকে দেড় কেজির মধ্যে হলে ভাল. তবে এবার আমি যেই রান পেয়েছি তার ওজন আড়াই কেজির মত (৫ পাউন্ডের একটু বেশি) . এই মাপেই রেসিপি দিচ্ছি. ১. প্রথমেই ব্রাইন . ব্রাইন হলো লবনাক্ত পানিতে মাংস বেশ অনেক্ষন ভিজিয়ে রাখা. এতে মাংস খুব জুসি থাকে ,ড্রাই হয়ে যায় না. এই পার্টটা বাদ দিবেন না. অনেকে খাসী ,ছাগল থেকে গন্ধ পান. ব্রাইন করলে এই গন্ধটাও থাকে না. আমি প্রথমে রান তা ধুয়ে কাটা চামচ দিয়ে কেচে নিয়েছি. এরপর আধা কাপ লবন দিয়ে শুকনা ভাবে মাখিয়ে রেখেছি ১ ঘন্টা. ১ ঘন্টা পর ভাল করে ধুয়ে আরও ২ ঘন্টা দুধে ভিজিয়ে রেখেছি. এই দুধে ভিজানো হলে আর কোন গন্ধ হবে না. গেরান্টিড. পুরোটা দুধ না হলেও, দুধ মিশানো পানি হলেও ক্ষতি নেই.২ ঘন্টা পর ভাল করে ধুয়ে কিচেন টিসু দিয়ে মুছে নিন. ২. মেরিনেইডের সব মশলা মাখিয়ে ফ্রিজে ২৪ ঘন্টা রেখে দিন. আর বা হলে কমপক্ষে ৮-১০ ঘন্টা. ৩. তেল গরম করে মাংসের এক পিঠ দিন. ঢেকে দিন. চুলার আচ মাঝারি থাকবে. ৫ মিনিট পর উল্টে আরেক পিঠ দিন. আরও ৫ মিনিট ঢেকে রাখুন. এখন পিয়াজ বাটা ,আদা ;রসুন বাটা আর মেরিনেইডের বাকি মশলা দিয়ে কশাতে থাকুন. মাঝারি থেকে কিছু কম আচ থাকবে চুলায়. ১০-১৫ মিনিট কশিয়ে আধা কাপ পানি দিয়ে ঢেকে দিন. চুলার আচ কমিয়ে দিন. ১৫ মিনিট পরে রানটি উল্টে দিন. আরও ১৫ মিনিট রান্না করুন. অল্প পানি লাগলে যোগ করুন. মেরিনেইডে যেহেতু লবন আছে, তাই চেখে লবন যোগ করুন. আরও ৫ মিনিট রান্না করুন. নীচে যেন ধরে না যায়. চাইলে অল্প পানি যোগ করা যায়. স্বাদ অনুযায়ি চিনি দিন. কেওড়া আর গোলাপ জল দিন. চুলা বন্ধ করে দিন. ৫. এবার দ্বিতীয় স্টেপ বা ওভেনে দেয়ার পালা. ফয়েল বা বেকিং ডিশে রানটি রেখে গ্রেভি’র অর্ধেক মশলা দিয়ে দিন. কিছু মশলা সেইভ করে রাখলে ভাল. ফয়েল দিয়ে ঢেকে রেখে প্রিহিটেড অভেনে ৩৫০ ডিগ্রি ফারেনহাইটে বা ১৮০ ডিগ্রি সেলসিয়াসে ১ ঘন্টা বেইক করুন. ১ ঘন্টা পর মুখের ফয়েল খুলে দিয়ে ,অভেনের টেম্পেরেচার কমিয়ে আরও ১ ঘন্টা বেইক করুন. চাইলে শেষের কয়েক মিনিট ব্রয়েল করা যায়. ১. রানের পা নিতে চাইলে রগটা এমনভাবে কাটুন যাতে পা টা বাকিয়ে আনা যায়. এতে হাড়িতে ফিট হতে সুবিধা হবে. আবার দেখতেও ভাল লাগে. ২. খাসীর রান থেকে পুরো চর্বি সরাবেন না. কিছু রাখলে ভাল. এতে নরম আর জুসি থাকে. ৩. খোসা সহ কাচা পেপে বাটা আর ব্রাইন করা ,এই দূটো পার্ট স্কিপ করবেন না. একদম সিদ্ধ হবার পর ক্রিম সহ বাকি মশলা দিয়ে আবার ফয়েল দিয়ে ঢেকে দমে রেখে দিবেন . একটা হাড়িতে পানি নিয়ে তার উপর এই রানের হাড়িটি রেখে দিলে সুন্দর দম হবে. 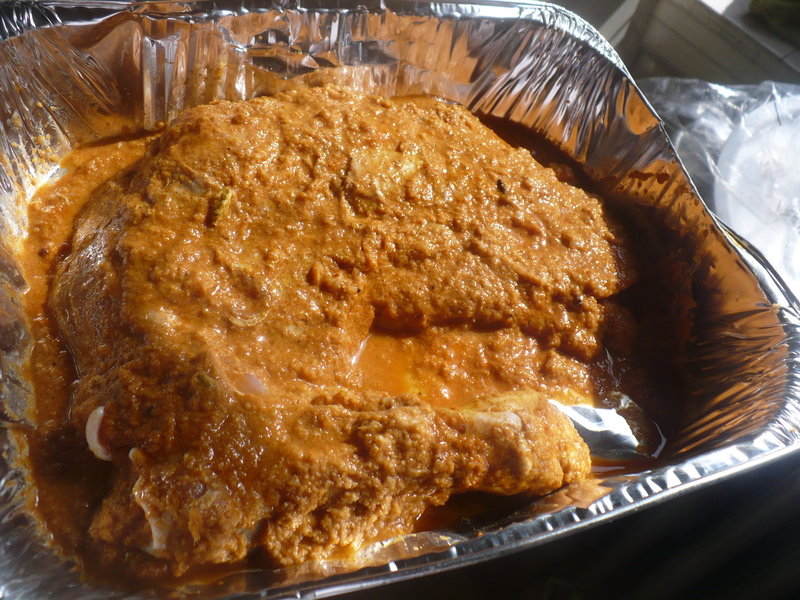 Raan Musallam is definitely a great choice for any special occasion to cast a spell on your near and dear ones!!!!!! Undoubtedly , it’s a kind of delicacy which amazes everyone with it’s “Shahi” kindda beauty and taste!!!!!!!! If you are planning to make any special item for Eid Ul Azha , go for it!!!!!! Though a little patience and labor required as some extra ingredients, don’t worry , it’s gonna be paid off by all the happy expressions of your family and guests!!!!!!!!! 1. Tell your butcher to break the bone of the joint of the leg in a way so that you can bend the leg . Now give deep cuts/ slashes to the leg and prick it well with fork so that spices get inside the meat well . Rub salt all over it’s body and leave it for 1 hour. then wash and soak in milk for 2 hours. It will keep the meat juicy and tender and also will remove any smell from the meat. 2. Marinate the leg with the marinade for 24 hours in the refrigerator . If not possible then at least 10/12 hours. 3. Chose a pot , where the leg fits perfectly. Now take the leg out from the marinade and add it into the oil .Fry it with lid on for 5/7 minutes at medium low flame . After 5/7 minutes , turn it over and cook the other side for another 5/7 minutes . add the whole garam masalas. Add the onion paste, ginger-garlic paste. Add the marinade into the oil with 1/4 th cup of hot water and cook well , what we call “koshano” in BAngla. Add the fry onions. Now add water and cook the leg with lid on till tender at medium low flame. 4. When the gravy is reducing add ,heavy cream/ thick milk, kishmish-kashew-almond paste and whole green chilies . Add sugar. You can add 1 tbl spoon ghee before you turn off the stove. Now the second part!!!!!! I’m going to put it into the oven for a final touch!!!!!! Those who doesn’t have oven , don’t worry . Just reduce your gravy a little more. 5. Place the leg in a foil tray with gravy . Cover it with aluminium foil and bake at 350 FH for 1 hour . Now take off the aluminium foil , reduce the oven temperature to 300 FH and bake for another 1 hour. You can broil it last few minutes of the cooking too. 6. Sprinkle some keora water and serve with Paratha, Naan or pulao. Microwave 1 teaspoon jeera/cumin, 1 tea spoon whole coriander, 1 teaspoon black or white pepper, 2 or 3 cardamoms,5 or 6 cloves,1/2 (half)teaspoon mace/ joyetree and little nutmeg together for 25 second.. Crush it into a smooth powder. 1. Marinate the meat with all the ingredients, except milk,salt, sugar , chopped onion, oil and maowa/khoya for at least 8 hours. Cook very well adding water little by little…That is what we call “Koshano” in Bangla. It should be cooked like this for at least 1 hour. 3. After ” koshano” add water and potatoes..Cover the lid.When the gravy lessens add milk..Add lot of green chillies..You may add littlel mace(joytree),cardamom powder again.. Add poppy seed paste..Lastly add little sugar, 1 and half teaspoon is perfect for me, and maowa/Khoya..
4. Turn the stove on very low heat and cook the korma for another 10 minutes .. That’s what we call to keep on “Dom” in Bangla. You may sprinkle little keora water before serving..
1.Wash the mutton thoroughly..Marinate 1 kg mutton with garlic paste, ginger paste, onion paste,bayleaf, cardamom, cinamon, coriander powder, chili powder ,1/2 cup oil and salt in a pot for at least 1 hour before cooking. The longer is marination the yummier it is..
2.Place the pot on the oven on a medium flame..Cover the lid and let the water come out from the meat..Cook very well adding water little by little for atleast 45 minutes to 1 hour . That is what we call “Koshano” in Bangla. 4.When the gravy thickens and almost drying out add 1 cup regular milk , 1/2 cup heavy cream, and 1 and 1/2 teaspoon sugar…Let them cook until the desired gravy appears…Give handful of green chilies. Add the special garam masala powder at the end of the cooking…Cover the lid until u serve.